The Tesla Model S has an amazing 17" touch panel display in the dash board, offering full internet access along with a full gamut of infotainment services, which now include the TuneIn internet radio streaming platform. TuneIn, the service to access radio broadcasts over the Internet, announced today it will be available on the Tesla Model S touch panel display. This makes the 200th distribution deal for TuneIn, and is the first time TuneIn has been available in any vehicle dashboard system without the use of a smart-phone application. This underscores the flexibility of the Model S touch panel display. The center display on the Tesla Model S dashboard is a 17" LCD display. Software running on the display runs an infotainment system, that controls the heating and cooling system, lets the driver customize settings on the Model S, and tune in radio stations and the like. It also sports full Internet access using 3G wireless technologies, and there is a full web browser running on the display. The new TuneIn application for the Tesla Model S lets the driver tune in to any of the myriad of internet radio stations, from around the world, available via the TuneIn service. The company claims the TuneIn application user experience is designed for minimal distraction, and screen shots provided by the company look similar to tuning a radio. 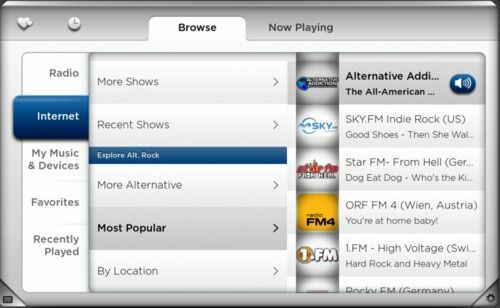 With the TuneIn App for iPhone one programs in "Presets" which appear on a home screen for easy access to favorite stations, or one uses the search function to find desired stations. TuneIn broadcasts stream over the Internet connection built into the Model S. The service provides excellent sound quality even for radio stations located on other continents. For example, the yearly TT ZERO electric motorcycle race is broadcast live by Manx Radio, one of the stations available through TuneIn, allowing a reporter to cover the race without attending in person. TuneIn obviously consumes Internet data, but it's unclear from the Tesla Motors website whether the Model S owner will incur any data charges as do smart phone users. The Tesla Model S is an all electric sedan manufactured by the company which brought us the Tesla Roadster. It has a EPA certified 265 mile driving range (Tesla claims over 300 miles), with performance that smokes the Tesla Roadster, and an amazing range of features. Nice - one of my favourite iPhone apps, TuneIn is surprisingly reliable and a welcome addition.